I’m stealing some time at the computer, trying to finish a few emails, posts, etc. Nothing I’m writing is going to change the world, but doing so provides some space for me and me alone. Lennon is in his bouncy seat moving between what seems to be utter contentment and sheer misery. I go to him every three minutes or so to reposition him and re-engage him, when talking to him doesn’t seem to do the trick. I get a small reprieve by moving him into his new favorite spot, the car seat, which sits on our living room floor. I make sure his pacifier is in. Side bar: Before I had Lennon, I would have been pretty smug reading about the above mothering techniques. My pre-mother self would never use a pacifier and would never consider using the ‘putting out of fires’ form of childrearing. Even now, I consider myself an attachment parent and spend most of my day joyfully playing with Lennon in a dream state of ‘Kairos’ time (props to Glennon and Don't Carpe Diem.) Our nights are spent bed-sharing and night nursing. We are careful with how we use the pacifier and make sure it is benefitting him more than us, when we do. But sometimes Mommy needs a minute, and so does baby. And lest you think this is a motherhood unexamined, I refer you to this, which among other feelings, aroused relief. -I pause and breathe. Just being able to do this at this moment makes me grateful. -I look at my beautiful son and I remember how hard he is working to grow, on his own, in his car seat. I am grateful. -My adorable husband is vacuuming. This is a no brainer. -I have been eating healthy and on plan for two whole days now. I am grateful. -I live in Europe. When I first arrived, I experienced severe culture shock, and thought I’d rather live anywhere in the States than here. My husband explained that the winters in Vermont were far worse. Somehow, this comforted me. I am grateful. -I know why I am sleepy and know it will change. I am grateful. -Fruit flies around my tea will always be the bane of my existence, but I have a home for them to be in and tea for them to buzz around. I am grateful. 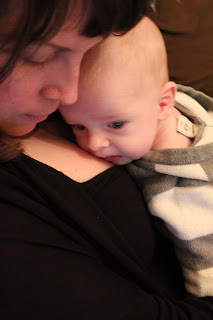 Lennon is fussing again now but I remember that it’s time for his nightly bottle, which my husband prepares and administers, so I can be grateful again. Just to cover all my bases with the most patient man in the world, I apologize for any hint of annoyance. It really is a one moment at a time process, parenting (and also, I suppose, wife-ing,) forget about one day at a time. Then Lennon starts to cry before the bottle can get there. I drop everything and scoop him up because all I care about and want to do at this moment is hold him and be in love.